All transactions are safe and secure with a reliable history in online purchasing behind each of our associates. 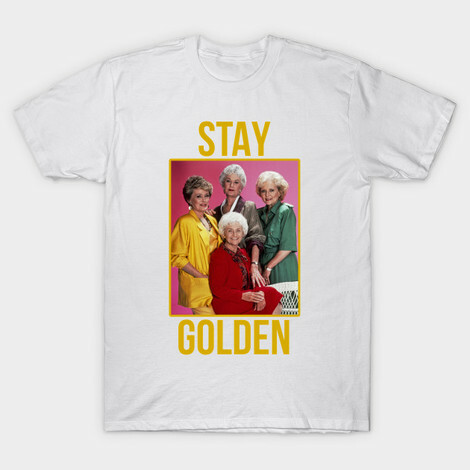 Buy the Golden Girls Rules t-shirt to own Golden Girls clothing and merchandise. Yep, My Girls are Golden! This shirt will teach you how to live. Blanche Devereaux (Rue McClanahan), substitute teacher Dorothy Zbornak (Bea Arthur), St. Olafian animal lover Rose Nylund (Betty White), and spunky Sicilian Sophia Petrillo (Estelle Getty) are all models to live by. No matter who is front and center in your heart, this is the tee for you. This Golden Girls shirt displays a portrait of the women. Make your girl friends jealous and grab this tee today. In addition to the Golden Girls Rules tee above, browse the Golden Girls Clothing Gallery for more apparel like men's and women's clothes, kids shirts or hoodies.